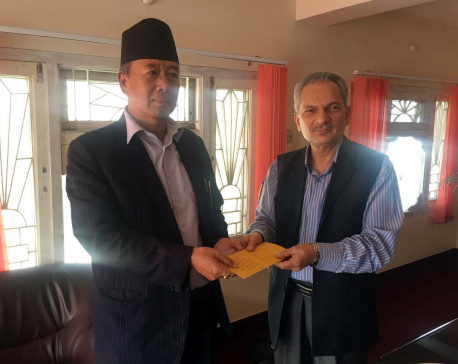 KATHMANDU, April 29: Naya Shakti Nepal and Federal Socialist Forum Nepal, which last week announced to use same election symbol, have agreed to field consensus candidate in the local elections slated for May 14. A meeting of top leaders of two parties on Friday formed a joint team to oversee the candidate selection process and manage other elections related affairs. The 'Joint Election Coordination Mechanism' includes Hem Raj Rai, Dan Bahadur BK, Ajambar Rai Kangwang, Dhirendra Shrestha, Ganesh Yojan and Laldhoj Tamang from the Federal Socialist Forum Nepal. Similarly, Ramchandra Jha, Durga Sob, Devendra Poudel, Parshuram Tamang, Parshuram Khapung and Khimlal Devkota are in the joint team from Naya Shakti Nepal. The mechanism will field the consensus candidates across the country and resolve all disputes related to elections. “The priority will be to resolve the candidates related disputes at the local level. If the lower committee fails to do so, they will be directed to forward the dispute to the central mechanism,” Naya Shakti Nepal spokesperson has said in a statement.